Master Series truck body for Military Applications for Air Force, Army, Marines, Navy, National Guard and many more. We’ve designed these truck bodies to serve in a way that no other truck body has ever done before! The use of this quickly removable and completely transferable full body capsule module is now currently used for military vehicle applications. This is in part due to its well proven history in the tough requirements of 4wd off road use in industry. The Master is a low cost alternative for some services by military service personnel. Explosives units for the transportation of military materials used for blasting and demolition. They are fully configured with a compartmentalized interior to keep materials separate. The are delivered ready for service. EMT Ambulance military units are available in a large selection of different configurations that include industrial and military applications. 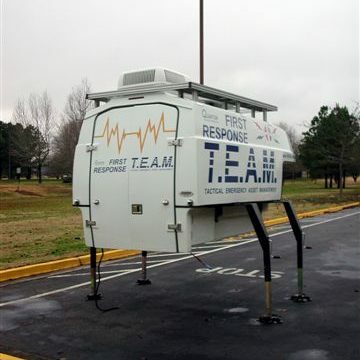 Mobile military field operations such as, mobile command stations, lab’s, field testing units, field offices and overall general remote field operation stations.These units can be delivered fully equipped for service operations with many comforts such as a climate controlled interior. Auxiliary 115v a/c & 12v power is available onboard for through a choice of power sources. Slip on military Pickup Truck Mounted, Water, Foam and Fire Fighting & Rescue Equipment units!These units are equipped for Jack Rabbit Rapid Response for Initial Attack service special field applications. Mobile Work Shop for general military field repairs. This drop down workbench is suitable for lock-smith and other base operational services. Base Maintenance Service HVAC Pick-up Truck Bodies for Heat Ventilation Air Conditioning multi-purpose service body for military Pickup Trucks, HVAC service vehicles that are ready for service! Some particular mobile advantages are the fact that the high capacity and the exterior design provide a favorable aerodynamic shape and performance. This shape also minimizes obstructive protruding corners that can become a hindrance, when navigating through difficult terrain or under trees and limbs etc.